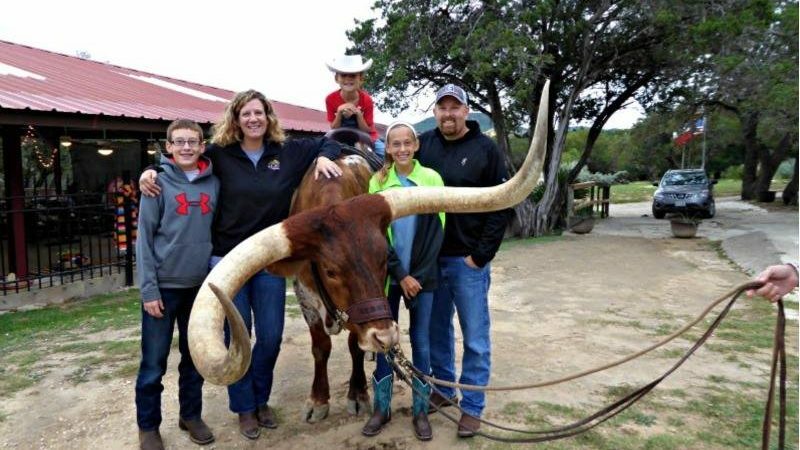 The Mayan Dude Ranch in Bandera, Texas is the quintessential Texas Cowboy experience. Sitting on the edge of the Medina River in the gorgeous Hill Country of Central Texas, it is the perfect place to unwind, relax and spend quality time with your family. We have visited this beautiful family-owned ranch twice now and we never tire of the quiet family fun and relaxation. As the Texas Traveling Mom, I pride myself on knowing all that Texas offers visitors. But can you believe after living here for the last 15 years, our family had never been to a dude ranch? I felt that if I was to be a true born & bred Texan, this was an experience I could not miss. 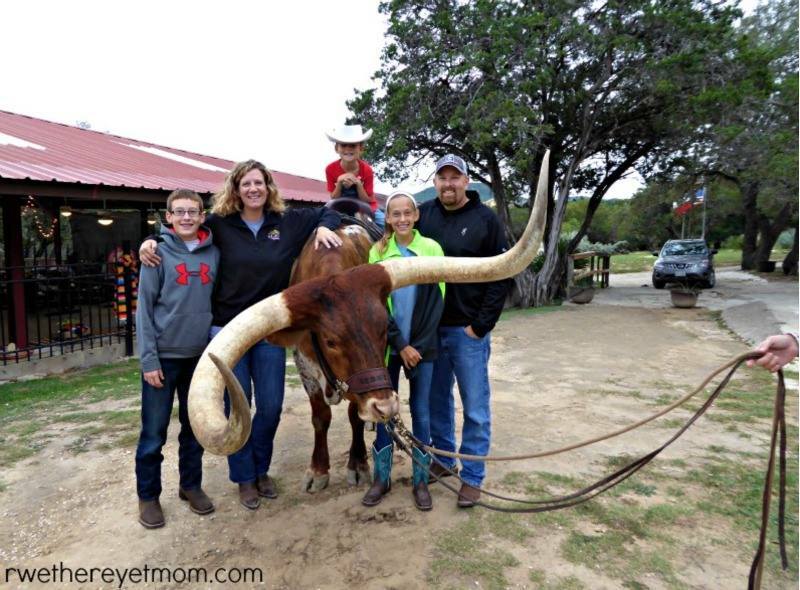 Last fall, my family & I headed to the “Cowboy Capital of Texas”, Bandera, to a wonderful family-owned dude ranch. We had no expectations, except to unplug from the world and ride a few horses. Three days later, we left with grins from ear-to-ear, full of amazing experiences one can only get at The Mayan Dude Ranch. The Mayan Ranch is a 350+ acre working ranch with over 60 individual cottages for families to stay in. The Ranch has been in the Hicks family for many years, and it is so lovingly cared for by this group of brothers and sisters who seamlessly run it. Though its close to town, you feel like you are in the middle of nowhere. With the peaceful quietness, the deer that come right up to your cabin each morning to nibble on the grass, and the big, bright Texas stars that seem to reach right down at you, THIS is Texas. So What Do You Do at a Dude Ranch? Let me be perfectly honest with you. I hear the word “working dude ranch,” and I automatically assume I have to rope a calf and clean a barn and all that what-not that comes with “working” a ranch. Maybe that’s the reason I didn’t ever plan to visit a dude ranch with my family. But after several friends had visited and praised the experience they had had, we knew it was our time to visit. The Mayan Ranch has planned activities all day, each day allowing you to experience a ranch, but giving yourself plenty of time to relax and enjoy your surroundings. The Mayan also has an amazing chef – one of the sisters – and you can enjoy 3 amazing meals each day. Cause you know, all that fresh air makes you super hungry! Here’s a quick video to show you some of the fun we had! I have been asked many time since I visited, “What exactly did you do on the dude ranch?”. The itinerary is paced full of fun activities, so let me give you a taste of what you can expect. We opted to stay in a private cabin at the Mayan Dude Ranch. You can stay in private cabins spread out all over the property or in a lodge. We loved our cabin. With three separate bedrooms, it was easy to spread out. The boys slept in a themed “Jail house” room. And yes, we had a tv, though it rarely got turned on. We were out having fun y’all. Longhorn Steer: The first evening began with cocktails at the main pavilion and a chance to meet this Longhorn Steer. We petted this sweet guy, posed for pictures and even sat on top of him. Y’all he was huge!! Family Games: The staff at the Mayan want you to “play” and make memories with your family, so they have all sorts of opportunities to play together. One night, we played tortilla tosses and dice games before dinner. Another evening we played fun team building games with other families. We haven’t laughed that hard in a long time. Dinner & Dancing: It wouldn’t be Texas without learning the two-step. Each evening,there are line dance lessons and opportunities for couple western dancing. My husband and daughter learned to two-step together here. It was so precious to see them dancing together. Horseback Rides: The Mayan Ranch offers two horseback rides a day (morning & afternoon) around the property. You go in a group and the ranch hand leads you on various trails. It’s such cool way to be outdoors and see the land. Kids under the age of 6 are not allowed on the rides. However, when we got back, our guy got a special guided ride around the corral. The staff was so great about not wanting him to be left out. Shooting Contest: We also participated in a BB gun shooting contest. After a few instructions, we were allowed a chance to prove ourselves with a target. Much to my surprise, my son actually beat my husband – made for some great teasing that day. Afternoon Relaxing: After lunch, you had your choice of another horseback ride, playing outdoor games by the pool, hiking to see the dinosaur tracks on the property or even shopping in downtown Bandera. Would it surprise you if I told you we did all of that? Wildlife Hay Ride: One of our most favorite activities on the ranch was the early-evening hay ride. We piled onto the trailer and watched as the deer came out to follow us (and the trail of corn being thrown behind). It was incredible to see that many deer in the gorgeous October dusk. Cowboy Breakfast: Each morning, you can enjoy an authentic Cowboy Breakfast. Set in a beautiful grove of trees, guests opt to ride horses or take a hayride to the chuck wagon. We dined on biscuits & gravy, scrambled eggs, grits, and unlimited coffee cooked right on the campfire. I swear being outdoors makes you hungrier! Just another amazing memory made at the Mayan. 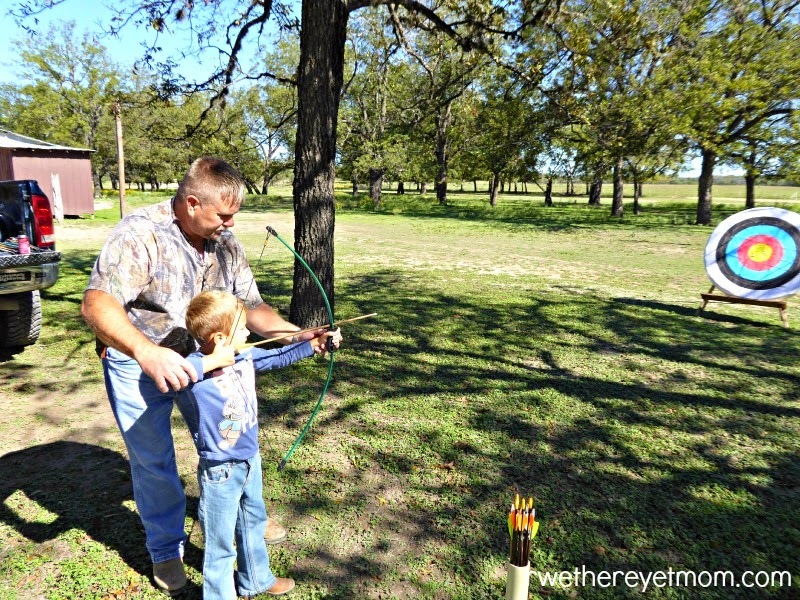 Archery: One afternoon, we choose to learn how to shoot with a bow & arrow. It was more difficult that you think – and again, the ranch hand was so good with my kids, especially the youngest. And before we knew it, our quiet, relaxing weekend at the Mayan Dude Ranch was over. We found the goodbyes lasted a bit longer than they would if you just took your family to a typical resort. We wanted to thank everyone, tell them what a good time we had, and even give a few hugs. You see, in the brief three days we stayed at the Mayan Ranch, you begin to feel a bit like family. Everyone – including the guests – are so very friendly, with many shared and amazing conversations that result in getting to known them better. The Mayan Dude Ranch was nothing like what we expected. Beyond all the Texas ranch fun, the best thing that came out of our weekend was the relaxing time we spent together as a family. We put our electronics away and bonded for a weekend. In this day and age, that is priceless. Memories like these are not easily made and we take home some great ones from the Mayan Dude Ranch. Every one of your experiences would be new to me!